Aero Express is an Authorized Distributor for the ASI-61W Test Set. Aero Express will buy, sell and trade the ASI-61W depending on your needs. 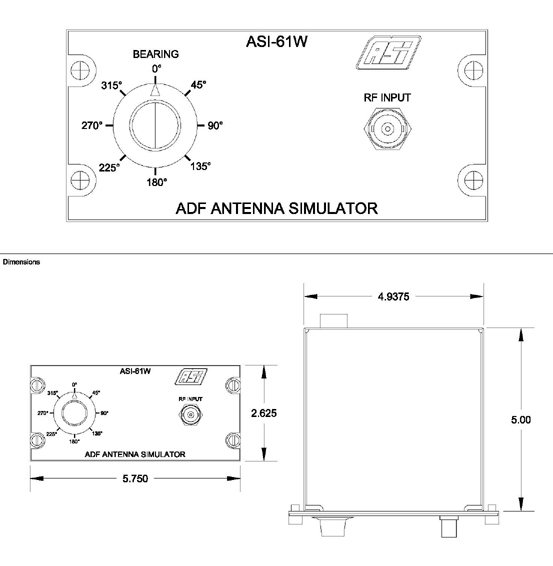 The ASI-61W ADF Antenna Simulator provides the simulated directional ADF signal required for testing and alignment of the Collins ADF-60A, ADF-60B, ADF-462, and DFR-206A ADF Receivers. The ASI-61W works in conjunction with the Collins 970G-1 (ASI-185), 970G-2 (ASI-375-X) or ASI-200-10/ASI-2000 for complete function testing of the ADF Receiver. The ASI-61W will mount directly into the face plate of the 970G-1 (ASI-185) or the 970G-2 (ASO-375-2). The ASI-61W is a Form, Fit, and Functional replacement for the Collins 970W-1/622-3099-0001.